As some of you might already know [because I have fantastic family - thank you auntie Kes] I was on the XC Trains 1728 dep Derby going to Plymouth, via Burton on Trent and Birmingham. I was carrying a sky blue front, black-rear backpack which had my camera, suntan lotion, charger and a blue shoebox with a red stripe and a white area on it. 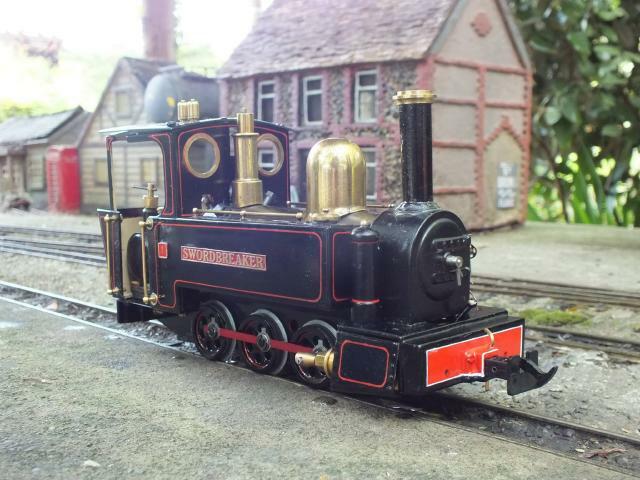 However the shoebox had my well-known 16mm live steam loco "Swordbreaker" [black 060] and so this has been stolen. BTP have been notified, as have Lost Property at Birmingham New Street. I'll be contacting XC directly tomorrow on a PNB, however I do know that someone in XC Control is already putting out the word. However it's highly likely that it's someone outside the hobby and railway community [large and small] who has the bag and the loco. If you've taken the camera, fine. I'd like it all back, but the camera I can replace. I can't replace the locomotive - I'd like to have it back, intact and undamaged. It's got a high sentimental value - you could say it's "been through Hell and back with me." It's also unique in the modifications, livery and chassis design that I personally designed or put up on it to advance the basic design specification. Any shares or leads towards it being recovered very greatly appreciated. And many thanks to everyone sofar who has shared the information at first from Matt and Kes or asked if I'm okay. I'm fine - goes to show how far I've come in 6 years since my time in the 'wilderness'. No one expects the SPANISH ACQUISITION!!! I always check the 'Stolen Items' heading on the Forum but only in the hope to see no new entries there. I am so sorry to hear that there is currently something to report. It seems this is probably an isolated opportunist crime without any knowledge of the contents of the carrier. Unfortunately this could mean the thief may have no information of the importance of 'Swordbreaker' both to Doug, and other garden railway enthusiasts. Let's hope it is given over to someone who has this knowledge, or possibly a charity shop where some potential purchaser might recognise it? I sincerely hope things work out well for Doug and look forward to hearing positive feedback on this sad story. Thanks for the share Laurence, much appreciated. BTP, Bham New St Lost Property and XC Control and customer services have all been made aware of the situation. The luggage area was formerly the shop so I am told there would indeed be CCTV on the area in question. Peter Butler:119087 wrote: I always check the 'Stolen Items' heading on the Forum but only in the hope to see no new entries there. I am so sorry to hear that there is currently something to report. I hope that it was an error, but suspect that it was an opportunistic theft - they saw the backpack and thought it full of gadgets [smartphone, chargers, laptops etc] that they could resell for profit or personal gain. It would be very likely that the currently holder has no idea of the value or even the workings of the loco and may either disregard it withi their own dwelling or worse, dispose of it eg into the ground or a local canal. I can only sincerely hope that the loco is returned - anonymously or otherwise - in unscathed condition. Its more likely if they don't know what it is that they will either take it to a pawn broker type place, put it on Gumtree or eBay, hoping they can make some good money on it, so its worth keeping a look out for it appearing for sale. I sincerely hope you get it back in its original condition. Dreadful news. I hope it turns up intact and soon. One consolation is that it's a very distinctive and unique loco so should be instantly recognisable if someone tries to hawk it. Whereabouts on the journey did you notice it was missing? Might be worth some of our brethren trawling the secondhand shops in any of the towns/cities where the train passed through to see if it's sitting on a shelf there. Also, might be worthwhile keeping an eye on eBay for the next couple of weeks. I'll post a message on the G Scale Central forum. I could also post on the 16mm board, the 16mm FB page and the NG garden railways FB page - unless this has been done already. I'm very sad that this happened and I hope that Swordbreaker is found soon. I'm glad to see the amount of traders posting notice's about the engine on their websites. It just proves how much comradeship is in the hobby. Hopefully the criminal is a moron and posts it on ebay. As a regular ebay user it would be easy to spot! Sorry to hear that some rotten little toe-rag has made off with Swordbreaker Doug, I hope you get it back in one piece. At least it is so distinctive that it will make identifying it easy and should it be run in public, some one will notice. BTP have checked out Burton-on-Trent, apparently nobody got off there from my train unit. They have received the Bham New St footage already and are 90% sure that they have identified the thief judging by the fact someone was carrying the bag matching my description - the fact that the bag on the film was skyblue, had several front compartments but the clincher to me was the fact the bag was weighed down at the bottom as if a heavy box was in it --- which of course, there was containing a 2.3kg loco and tons of bubble wrap. They are still awaiting the on-train footage from Cross Country. That's good news. Fingers crossed that someone recognises the villain.